"How could you wound me like this? I thought—I thought— I could trust you!" I hoped I sounded more intimidating than I felt. "What nonsense are you muttering? I think this sudden freedom has your thoughts cluttering!" "You stole the powerful artifact that King Hagan asked me to deliver to Princess Amira!" "What? I did no such thing! I would never hurt my friend, whom I value more than a king!" "Tell me where you hid it!" I angrily demanded. "What proof dost thou retain? What proof do you have that I am blamed as your bane?!" "You were the only one on the voyage who could have pilfered it; I kept it with me the whole time! I protected it!" "Well, you didn't do a very good job... someone clearly got away with a fob." Blinded by rage, I shouted, "It was you! I can't believe I trusted you at all, you lying thief!" I ran towards my house's rock plantation, as tears streamed down my face. I wished I had never begun my stupid adventure. I had my wish, I was home again; but without his artifact the Bringer of Night would simply whisk me back to prison. Calder crept up behind me. "I'm sorry, please forgive me? I really shouldn't have exploded on thee." "I'm sorry too, Calder," I sniffed. "I'm terrified to go back to that dark, lonely cell and if I don't locate the artifact, I will be stuck there forever! The Bringer of Night granted us our freedom; if I don't locate the artifact like he asked... then he will send us back." Calder's eyes grew wide. "The Bringer of Night?! Have you not heard the tale? It's one of horror, in which thankfully he does not prevail." "No," I said, horrific thoughts filled my mind. What evil had I begun? That he never return was everyone's plight. His slumber disturbed, his horrors he incite. Until, the Bori, who awakened him, reappeared. His courage tore the Bringer to shreds. If thou art spared, then thou art blest." "What have I done?! I made a deal with him!" "If I had to take a guess, I would say he's having a little fun at your expense. Trying to tear your friendships apart, but he can't hurt what adventure is in your heart." I smiled at Calder. He was right. I'm not going to let The Bringer of Night get away with this! "You hear that, Bringer of Night! I won't fall for your tricks!" I yelled, with a bit of bravado. The sky turned pitch black, the sun no longer shone through the clouds. The once beautiful, green rolling hills turned an ugly shade of grey. The trees and flowers wilted; it almost seemed if they carried somber expressions of their own. Color seemed to fade from the world. His recognizable voiced echoed, "You've made a grave mistake..."
Suddenly, Cap'n Jellie began to grow rapidly. Within seconds, he had grown as tall as me. He quickly became taller than Calder, and soon he was bigger than my shanty cottage. "Cap'n Jellie?" I touched his squishy skin. "We need to get out of here!" Calder began to run. "The Bringer of Night could cause us to disappear!" I tried to follow Calder, but my paw was stuck. I struggled to escape, but I only became more entangled in the gooey substance. "Help!" I pleaded. Calder ran back to assist me, but it was too late. I was trapped inside my gooey friend. I could see Calder yelling something and wildly waving his arms outside of my edible cage, but it's the last thing I remember before losing conciseness. A furious Galgarrath interrupted, "This is the same glib we hear every week! Master Vex, why let this fool continue?" "Good sir, if you will just give me but a moment to tell my tale-"
"You are nothing but a lowly prisoner!" Galgarrath roared. "Settle down, Galgarrath. I'm intrigued – watching prisoners isn't the most exciting of duties – Number Five, do continue." I could hardly believe my eyes – I still remember my first moments there, clear as if it had happened yesterday. I pinched myself, excepting to awake from an exciting dream; but this was real. The roads, the flowers, the buildings – all made of delicious, edible, wonderful jelly. I wanted to live in that magical place forever. Unfortunately there was only one problem with my plan, both of my friends: Calder and Cap'n Jellie were gone. If I remained in this land of Jelly – which I began to call Jelly World - I would never be able to see them again. Suddenly a Jelly Chomby, wearing a pirate bandana skipped out of a building towards my rock. "Cap'n Jellie reporting for duty, sir, I'm glad you are finally awake!" "Cap'n Jellie?" I was stunned. My half-eaten jelly was – was – a Chomby?! "Yessir! 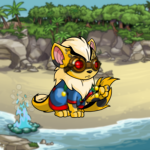 I'm ready to sail the Neopian seas with my first mate!" "But- you- you- were only a jelly!" "And I'm still only a jelly, sir – everything is made of jelly here! I must thank you for saving from the rubbish dump, who knows what would have happened if you hadn't?" "But, then you grew and entrapped me?!" "Oh, I guess I should explain..." Cap'n Jellie smiled. "This is Jelly World, a secret land known only to the Neopets like myself – and now you, of course. But, like you, I grew tired of my home – somehow even a dream world can become boring – and I found myself exploring the rolling hills of Meridell. My first encounter with the denizens proved to be quite intimidating. A blue Kacheek, was yelling, 'Git off mah land, youngins!' I had never seen Neopians that weren't made of jelly before, and this one was especially terrifying. As he headed my way, I disguised myself as any normal jelly would look. He picked me up, took a bite out of me, and then threw me away in that horrid, smelly dump." "Did it hurt?" I asked, stunned. 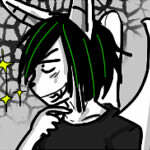 "Not a bit - jelly Neopets are mostly made of jelly- and I was lucky, he only got my tail." Cap'n Jellie wiggled his stub of a tail. "And that's when you found me! Oh, I was so glad to meet you! I thought all non-jelly Neopets were mean and nasty like that blue Kacheek, but you – you were nice! I was so honored to be your friend." "Why didn't you drop your façade, then?" "I thought you and the others wouldn't believe me – at least not until you saw this place. I was afraid I would lose you as a friend." "Of course not, all I really wanted as a friend too. But- what happened after the Bringer of Night sent me to Meridell? Why did you grow?" "To protect you. The Bringer of Night had entrapped you, Calder, and me in a terrible nightmare. I knew well of these terrors of the night, because his nightmares had plagued Jelly World only a few years ago. The only way to save you from was to bring you here." "I tried to save him too, but I just couldn't grow any large-"
"So he's still tangled in my nightmare?!" "We have to go back for him! I can't let him suffer for my mistake!" "But, it's dangerous! The Bringer of Night controls every aspect of your nightmare! Who knows what he could do?!" "That's not true," I said, hoping I sounded brave. "He doesn't control Calder, you, or me. We can overcome him. How can I get back?" Cap'n Jellie pointed to a humongous tower of jellies, seemingly touching the sky. "We call it the Giant Jelly. I climbed to the top and discovered a hole in the sky, which led to your home." An ominous, small black hole could be seen near the top of tower. "It's unusually dark – my guess, the Bringer of Night noticed your disappearance – when I discovered it, the hole was unnoticeable, blending in with the rest of the sky." ...It took quite a while to reach the top and my fur became crusty from the sticky substance. I didn't care, adrenaline pumped through my body; I was ready to not only rescue my friend, but face the terrifying fiend who caused this mess. I was so ready that I nearly sprang myself through the dark mysterious hole in the sky that led to Meridell. "Wait!" Cap'n Jellie grabbed me at the last minute. "That hole is in Meridell's sky as well! You wouldn't be able to survive the fall!" Cap'n Jellie clearly noticed my apprehension. He smiled and offered his back to me. "Luckily, you have a friend that's made from jelly, who can take a fall." I hopped on his back. Cap'n Jellie leaned back on his haunches, and with a great push, we flung ourselves into the murky darkness. Nothing but darkness surrounded us, but the cold, sniveling voice filled my ears again. "I knew you'd come back... Your friendship with Calder, it's pathetic; you were lucky enough to escape, yet you risk you safety returning, all because of your friend... Well you wasted your time..." a figure emerged from the darkness. It was Calder's body alright, but his eyes glowed red like the Bringer of Night's. "Your efforts were all in vain," Calder continued, "I never really was your friend..."
"You were only a poor, little peasant... a rock farmer." "Please stop!" Tears welled in my eyes. "Why would anyone ever want to be your friend?!" Cap'n Jellie tried to calm me down. "It's only a nightmare; don't let him get to you." "He's under the Bringer of Night's control!" Cap'n Jellie continued. "You've got to break it!" "Calder!" Tears came spilling down my face like a waterfall. "You were my first real friend! You appreciated me for who I was; you weren't biased toward me because of my father's profession. You may think of yourself as only a lowly bard, but I see you as much, much more; I couldn't have asked for anyone else to have accompanied me on my journey. I never really got a chance to thank you, so thank you Calder... for everything..."
He stood silent for a moment, possibly pondering my spew of emotions. After what felt like ages, the real Calder returned. "Where am I? What happened to the sky?!" "Calder!" I gave him a big hug. Suddenly, lighting shot through the sky and the earth began to shake. "You! How... how... how dare you break my control! It's impossible! You were only a weak, insignificant Lupe!" the angry voice pierced my ears. "Bringer of Night!" There was a tremble in my voice. I looked at my friends, Cap'n Jellie and Calder, who both nodded in support. Empowered by their support, I continued, "I demand to leave this nightmare! You have no more control over us. I used to think of myself that way too, but your nightmare has only told me the opposite: I am now strong enough to stand against you!" And with that I found myself relieved to once again be on the chilly dungeon floor. My friend was actually a jelly Chomby... after that nightmare I found it hard to believe. Within my pocket lay my half-eaten pirate jelly – untouched from before the nightmare. Do jelly Neopians actually exist? Does Jelly World exist, or was it all a figment of my imagination? Somewhere inside of me, I felt that it was. Somewhere out there laid Jelly World – a land of my dreams – just waiting for my adventures to lead me there. Someday soon, I'd return; I could feel it. Footsteps could be heard coming down the stone steps to dungeon. An Aisha trussed in beautiful gold and white lead two guards toward our cells. I guessed her to be the renowned Princess Amira. "This is a travesty! These prisoners must be released at once! I can't believe Aten would commit such a horrid act; he deserves this as a home instead." One guard opened my cell, while the other opened Calder's. "I sincerely apologize on my power-hungry Uncle's behalf. You can be sure that he will swiftly be brought to justice, punished to the fullest extent of the law." "You hear that m'boy, we are free! This act fills me with glee!" Calder danced around the room. I was confused. "But... but... what about the artifact King Hagan asked me to deliver?" "It was found with one of his guards and has been extradited to Brightvale to be dealt with; you two are free to go with our apologies." "May I ask what the box contained? It seemed pretty important..."
"Oh yes, I nearly forgot! The box contained a note; King Hagan intended to give the artifact to you." I fancied what powerful artifact I might have earned. Maybe it was a Rod of Supernova or the legendary Bracelet of Kings! "The item was quite the oddity actually," Princess Amira laughed as she handed me a half-eaten pirate jelly. "I suppose you know what to do with it, though." It was better than any of the artifacts that I had imagined. The new piece fit snugly to Cap'n Jellie, making him a whole pirate jelly. "Thank you!" I grinned wider than I had ever before. "He also wanted to make sure you didn't forget these." She handed me the enormous bag of Neopoints King Hagan had previously paid me. "You left them in the merchant caravan." "We ought to be off, lad. What adventure awaits? Shall you be a knight in shining armor clad or maybe the sea lies in our fates? Dear Princess, I hate to bid you adieu for it makes me quite blue. Thank you for a timely release, may peace in your kingdom never cease." Calder's singing was wonderful to hear again. I nodded to Calder. "I like to be off as well, Thank you again Princess!" "I have arranged for a royal carriage to take you wherever you wish." Princess Amira led us up the stairs to the throne room, then to the gates of Sakhmet. "They will take you wherever you please." "Wherever I please?" I was astounded. My next adventure could happen wherever I chose... but there was one place – a place I wanted to go more than anywhere: Home. "I'd like to go to Meridell." Calder and I returned to my shabby – yet wonderful – house. With the Neopoints I had earned, we were able to turn my house in to what some would call a modest mansion. But, our adventures didn't stop there. Calder, Cap'n Jellie, and I continued to travel across Neopia – stories for another time. Everywhere we went, I searched endlessly for the mythical Jelly World, never able to locate it again. Thankfully, I still retain my wonderful memories of it. Someday, I know, I will visit it again." Number Five's eloquence was replaced by his normal screechy voice, "And that's the story of how Neopia was created..."
"What?!" Galgarrath was still angry about being silenced before, "That's it! I can't believe I wasted my time listening to this fool blabbing his usual nonsense!" Number Five hobbled back to his cell away from the Cellblock table; Master Vex would retain his legendary win streak once again. "I actually thought it was quite interesting, Galgarrath," Master Vex was clearly in a better mood, now knowing his win record wasn't to be besmirched. "I'm looking forward to another hearing another one." Squire Meekel piped up from a corner of the room, "We heard that entire story and he never once mentioned his real name..."
The Yellow Knight sat in his cell smiling, as he had done the entire story. Ugga-Ugga might not be that bad.